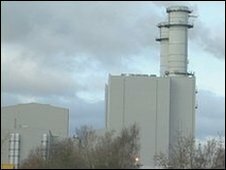 The building of a new £380m natural gas-fired power station near Southampton has been completed. The new facility at Marchwood is ready for full commercial operation, said Scottish & Southern Energy (SSE), which has a 50% stake in the site. It will generate enough electricity to supply one million homes, equivalent to the area including Southampton, the New Forest and Winchester, said the firm. There is no fixed date yet for its official opening. The power station is next to Southampton Water on Marchwood Industrial Estate. It has been built by Marchwood Power Ltd, a joint venture between SSE and ESB International (ESBI). The group said it would be "one of the most efficient generators of electricity in the UK". SSE said it was the UK's first large-scale "combined cycle gas turbine power station" to enter commercial operation for five years. The station's output is contracted to supply SSE. Is nuclear the low carbon future?